Every now and then, synchronicities happen that tell you you’re on the right path. Since I began my search for daily answers to the question, “Why am I so happy now?” they seem to pop up with increasing frequency. But few are as blatant or wonderful as the one that happened yesterday. After work, I was driving down a country road looking for the photo-of-the-day for my Flickr project. I was in a wonderful frame of mind – relaxed, happy, glad to be alive. All day I had been enjoying the panorama of playful clouds outside my window and I was looking forward to finding a good cloud shot for my photo for the day. I opted to drive down a country road and got a couple decent photos, but an insistent feeling kept telling me that I needed just one more. I kept my eyes opened for possibilities as I drove toward home. Finally I spotted a place I where I could pull off the road a bit. I parked and saw the roadside trees were hiding a cornfield lined with woods. It would make a fine foreground for the heaps of clouds I wanted to capture. I walked through the brush back to the corn and started shooting, loving the fragrance of the ripening corn, the beautiful blue of the sky. I had just finished a couple shots when I noticed the sound of a propeller plane directly overhead. And when I looked up, I could hardly believe what I was seeing. 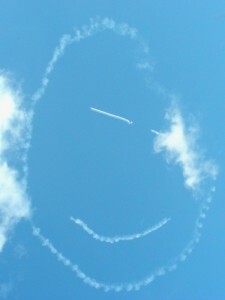 Right, there, directly above my head, the pilot was making a drawing in the sky. Why, I hadn’t seen sky writing since I was a kid! 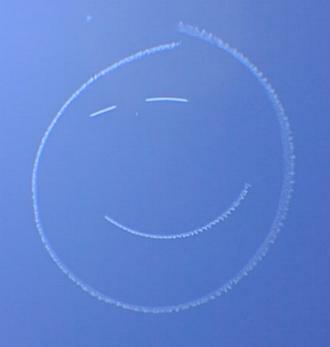 The little airplane was just finishing off a giant oval when I looked up. And then, to my complete delight and amazement, he painted a smile and lines for eyes. “Oh my gosh! 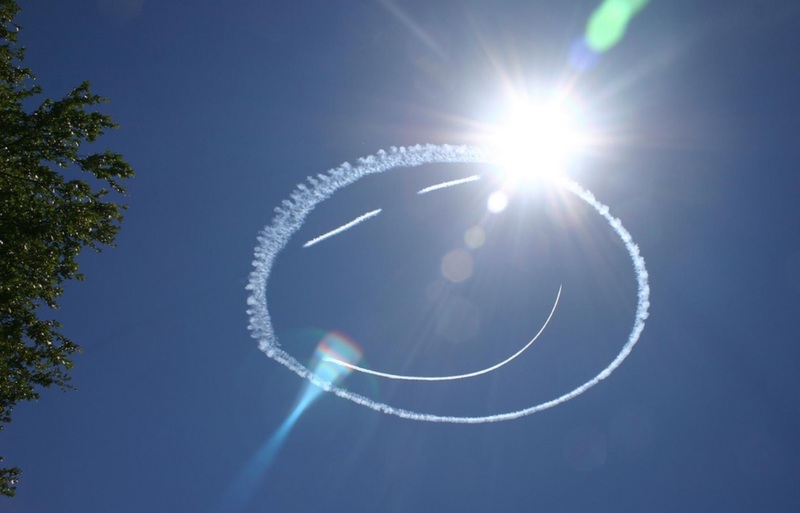 It’s a smiley face!” I gasped out loud, struck with wonder that this symbol of happiness was floating right above me. As soon as I recovered from astonishment, I grabbed the shot—and less than a minute later, the winds had blown the drawing away and the plane was gone. Had I not been in exactly that spot, at exactly that moment, I would have missed it. But obviously, I was meant to be there. This one was a present just for me. And I embraced it with wonder and joy.